As I write this blog I’m on the ferry crossing The Baltic Sea from Umea to Vaasa. It’s been a wild and adventurous month in Norway, full of stunning beauty and spectacular nature. With nearly 2000km ridden in Norway (a third of my total distance), I hope I’ve captured the host of experiences with the following photographic collection. From the mountains and fjords to The Arctic Circle, Norway became my cycling dreamland! 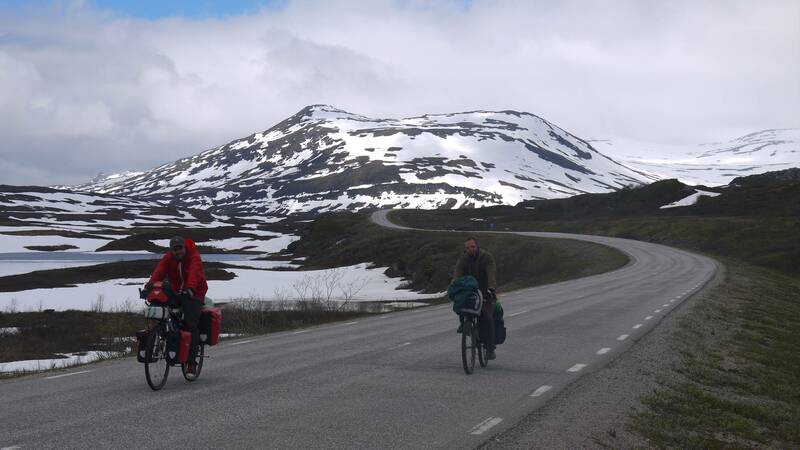 In one week I rode five mountain passes, including the famous Sognefjellet mountain pass. 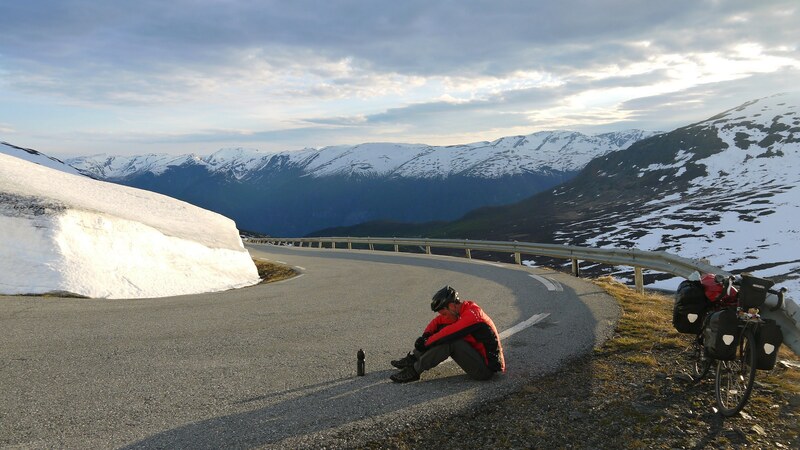 At 1434 metres above sea level (and of course you start at the fjords water’s edge so you feel each metre on the saddle), it is the highest road in all of Northern Europe. Most of these roads are only opened seasonally, and I was really lucky to arrive at some passes that had only been completely cleared of snow on the previous week. The mountain passes were stunning, and the hard riding predictably brought the greatest scenery. 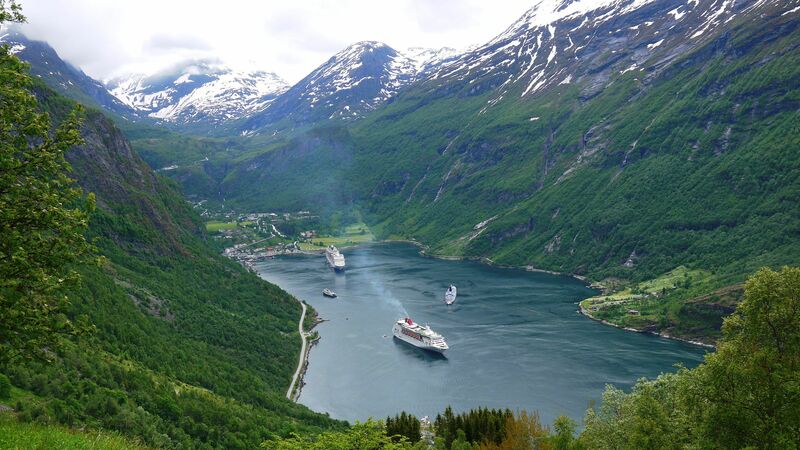 Norway is simply a camper’s paradise. 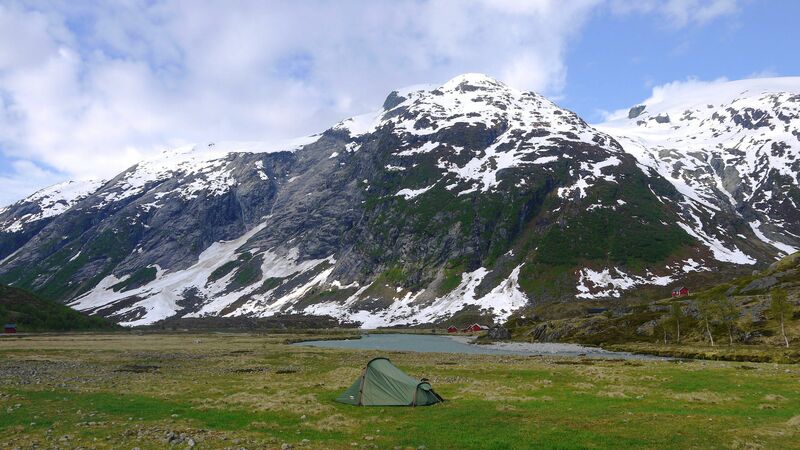 Unlike many other nations in Europe, in Norway you are allowed to pitch the tent almost anywhere as long as you leave after two nights and don’t leave a trace. 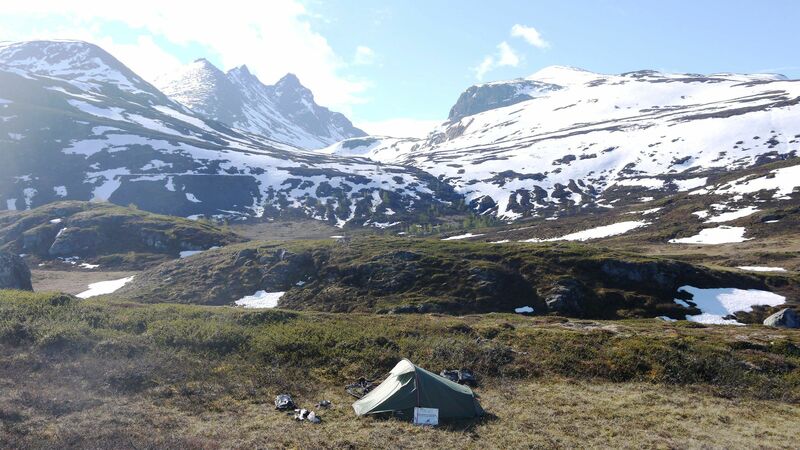 My favourite campsites were those amongst the spectacular mountains, ideally with nearby glacial meltwater to supply me with an endless supply of pristine water! After leaving Aurland late in the afternoon and climbing a set of twelve switchbacks I found myself stranded and utterly exhausted on the top of a snowy mountain pass. For the first time both myself and my gear camped in the chilly snow. In spite of the cold bum, I managed to sleep thirteen hours until 1pm the following afternoon! As I rode each day in Norway I soon learnt that what goes up must come down! The Eagle Road near Geilanger is named for its sheer height, and it is supposed that before it was built only eagles could enjoy such views. The switchbacks zigzagged straight up the face of mountains, and it was always a moment of euphoria when I finally reached the summit. 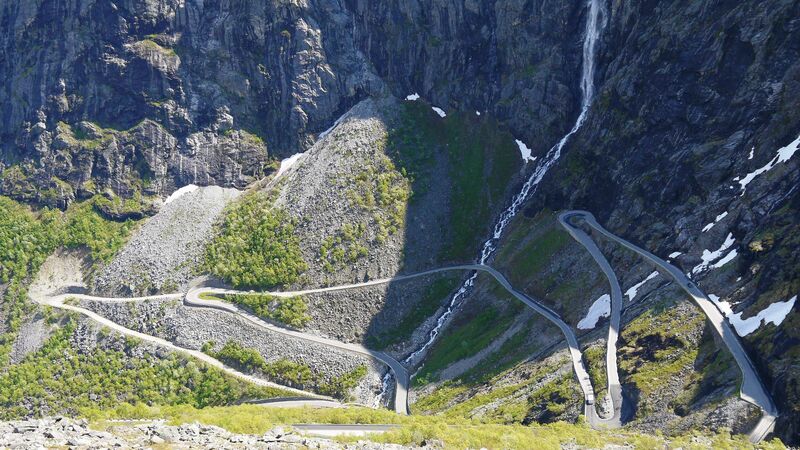 As well as such gruelling climbs I experienced some thrilling descents, such as the collection of switchbacks at Trollstigen. 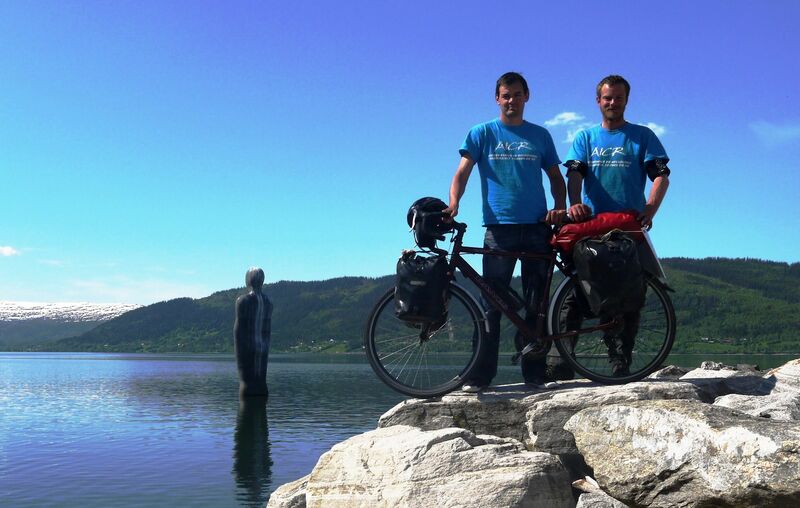 After the mountainous region of Norway a new challenge had to be tackled in the form of an epic race to The Arctic Circle. 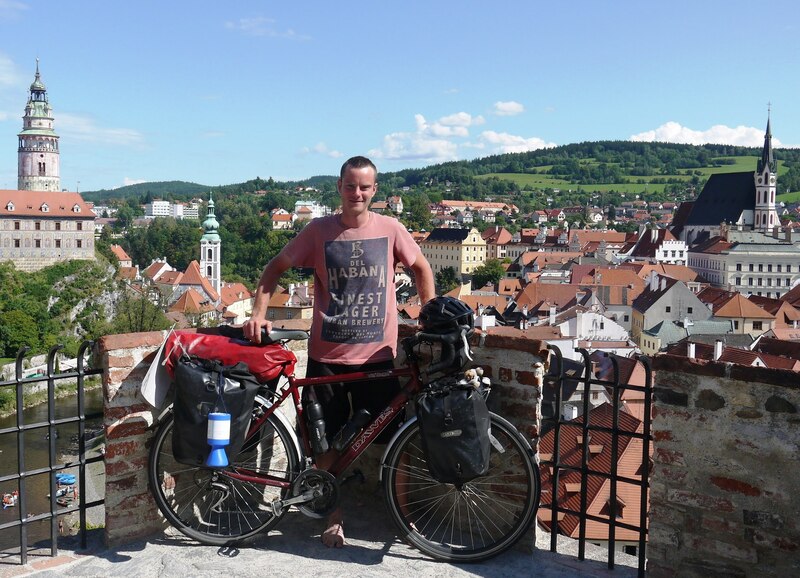 Jon Maiden, leaving from his home in Yorkshire, managed to hitch hike an impressive 2000 miles in just six days to beat me by 96km. Along the way he faced a multitude of challenges, and spread the word across Europe about the fantastic work of AICR. 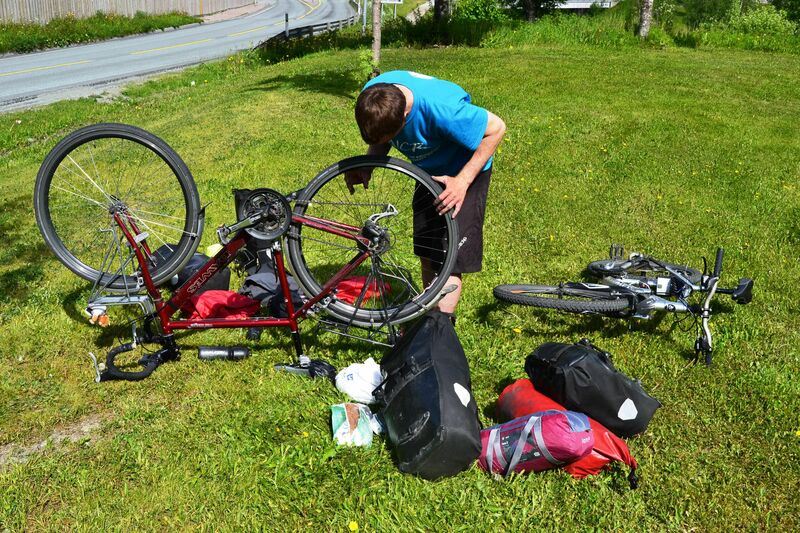 For my part I rode sixteen hours on-and-off the bike to cover 195km, so I’m calling it a draw! My soon to be published short video captures this mammoth ride. 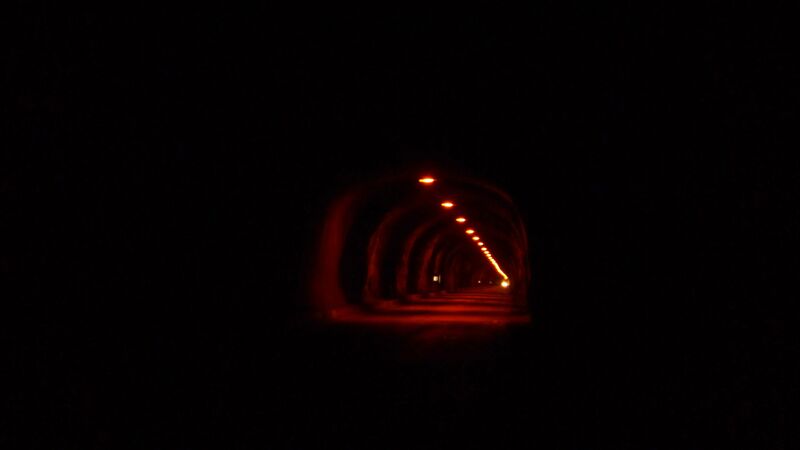 Norway is full of long dark terrifying tunnels, many of which are out of bounds for cyclists. On one particular day I had over fourteen kilometres of tunnels, the largest of which was 4.2km. As I didn’t have very strong lights I had to scramble quickly into the rocky sides every time I heard the monstrous echo or ominous lights approach from behind me. It was by far one of the most frightening and exhilarating experiences of my life! I’m happy to say that reindeer really do exist, and thankfully they are usually happy to have a smelly cyclist walk up to them for a closer encounter. I also couldn’t believe my luck when I saw a bear on the edge of the woods; it was an extremely rare sighting. It took a couple weeks of scanning the roadside as I peddled, but when I finally spotted my first elk they kept appearing each day. Their somewhat out of proportion figure and bizarre strut always put a smile on my face. My rear wheel has now had six spokes broken, and I’m anxiously riding south to try and reach an affordable bike shop in Eastern Europe. 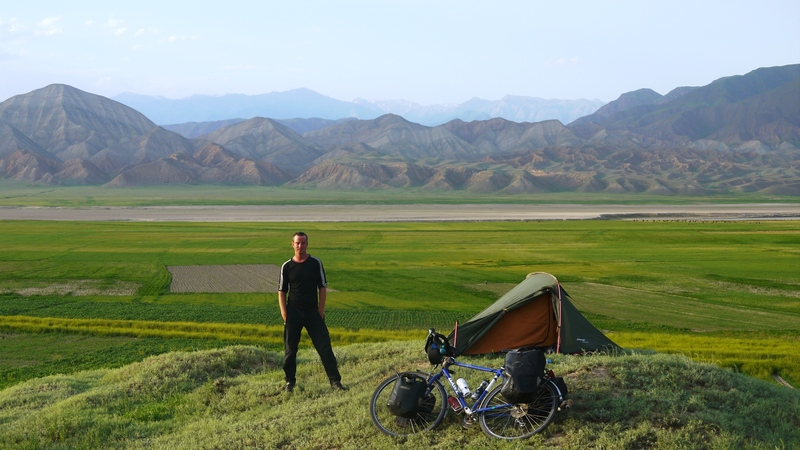 My wheels need to be upgraded for the rough road surfaces through Central Asia. 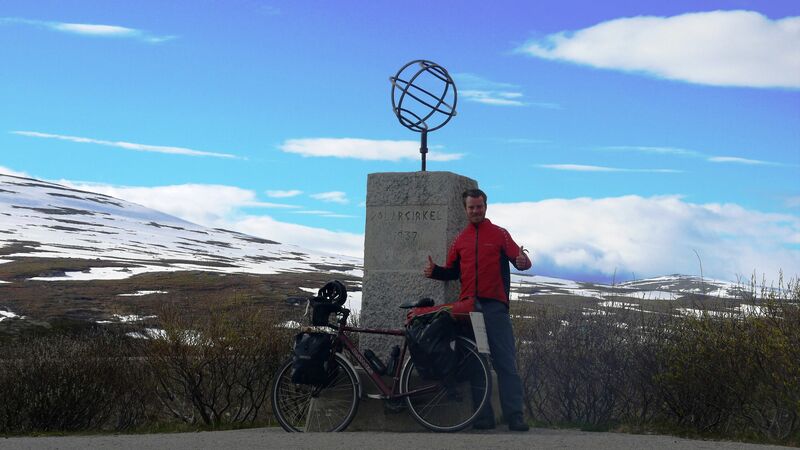 In this picture I had snapped four spokes when I descended down a gravel cycling path in the Arctic Circle town of Mo i-Rana. 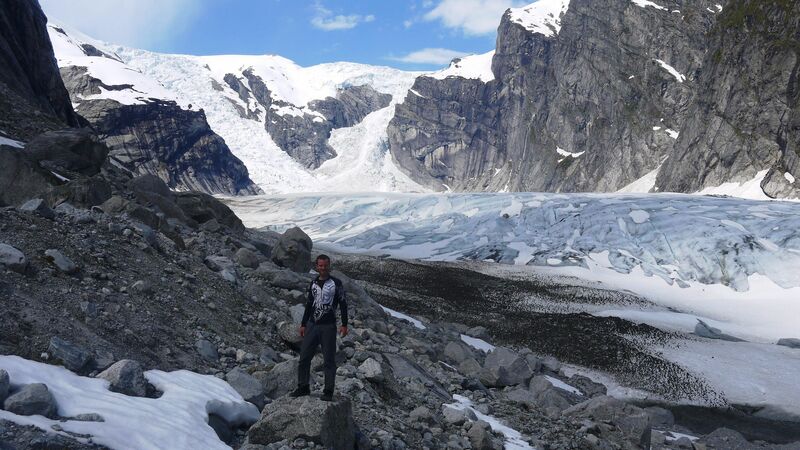 When I did get a moment off the bike in Norway, I subjected myself to some demanding walks to visit the glaciers of Norway. 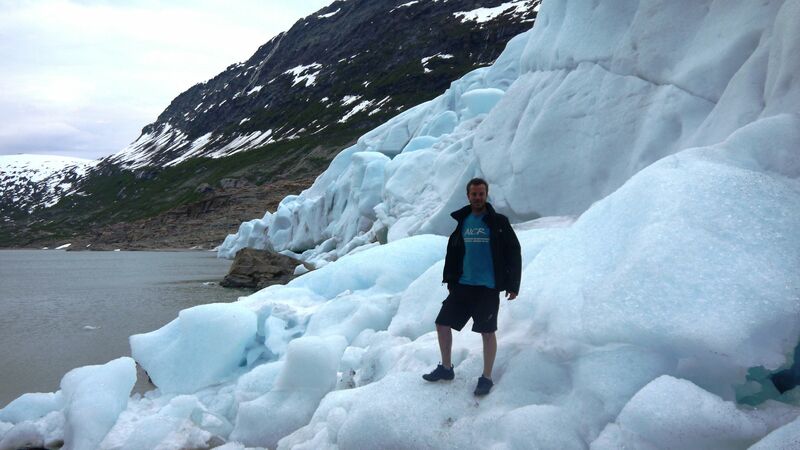 The first of these involved a magnificent walk along Austerdalsbreen inside Jostedalsbreen National Park. It took an 80km detour and a six hour walk, but the mountainous valley to reach the largest glacier in Europe was breathtakingly beautiful. 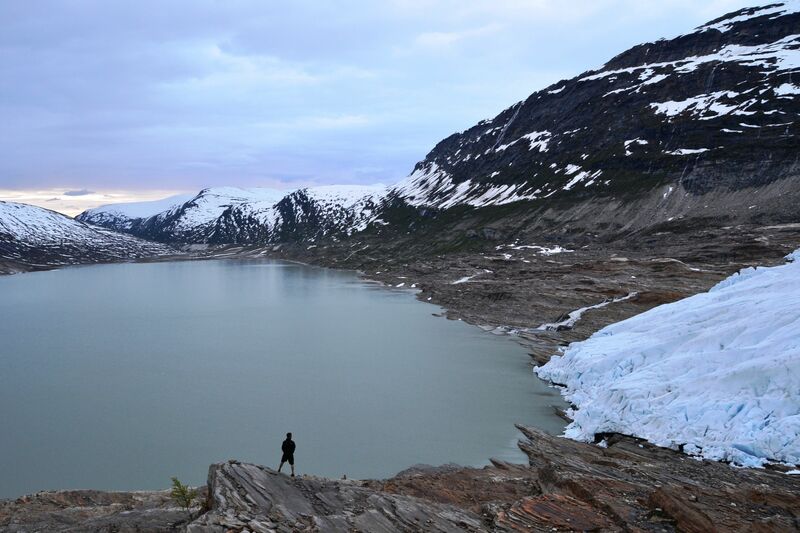 I also visited the glacial tongue of Svartisen glacier (Austerdalsisen) with Jon maiden. It was a really special moment walking to the glacier with a simultaneous midnight sunset and sunrise; and we were brave enough to briefly walk along the treacherous icy surface for a quick photo. 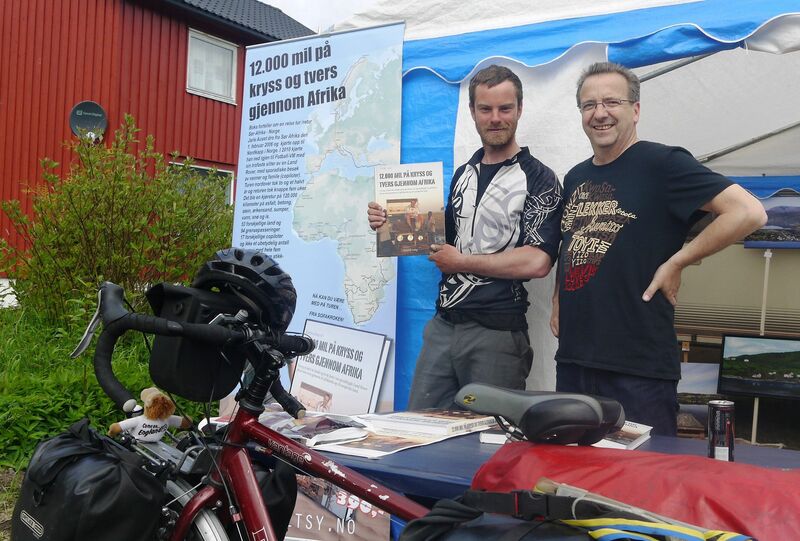 On the Norway Swedish border above The Arctic Circle I met Peter and Michael from the Czech Republic, and together we have joined forces to cycle all the way to Helsinki. 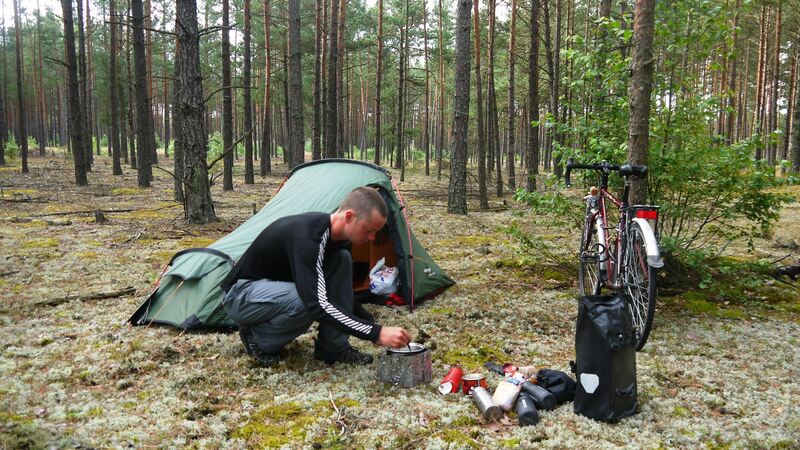 It has been great to share the road with other cycle tourers, and as we are able to pool together our gear and supplies we have been able to enjoy campsite fires each evening. To see my more of my cycling images of Norway please click here. Congrats on being freshly pressed! These photos are breathtaking. I really love seeing those ice on the roadside. Would love to visit Norway someday. You post is absolutely awesome!! How I wish I have a life like you!! oh my! This truly is amazing! wow! Really wonderful photos and I loved both the quotes! Best of Luck with your cycling! Congrats on being Freshly Pressed! Uplifting story, I hope that it continues to be as amazing as it seems to be already! Absolutely fabulous photos, I’m really jealous, I hopefully plan to travel to Norway after uni. Keep up the good work! Wow, what beautiful scenery. 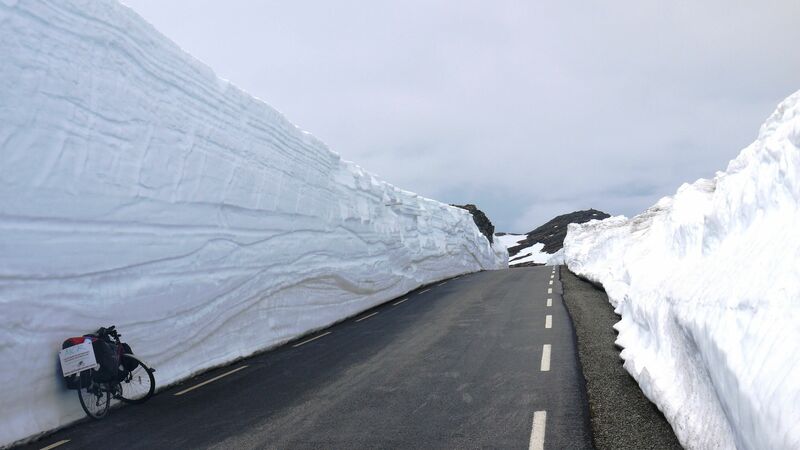 It certainly looks cold there in Norway, but great roads – my hubby would love to go there with his motorbike on those twisty roads. Congratulations on being freshly pressed. You’re very kind to do this for your charity -I will be following your progress. Simply beautiful! Thanks for sharing! Ah, this is amazing! 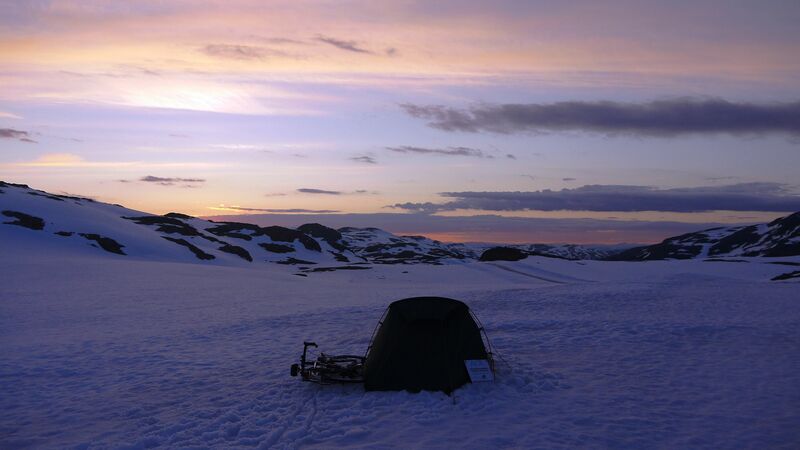 I hadn’t realised Norway is so open to campers… was that during summer? Beautiful! Would love to go there some day. What an absolutely amazing journey! And to do it all for a good cause! BRAVO! Love it! Your story and pictures are beautiful. Inspirational. 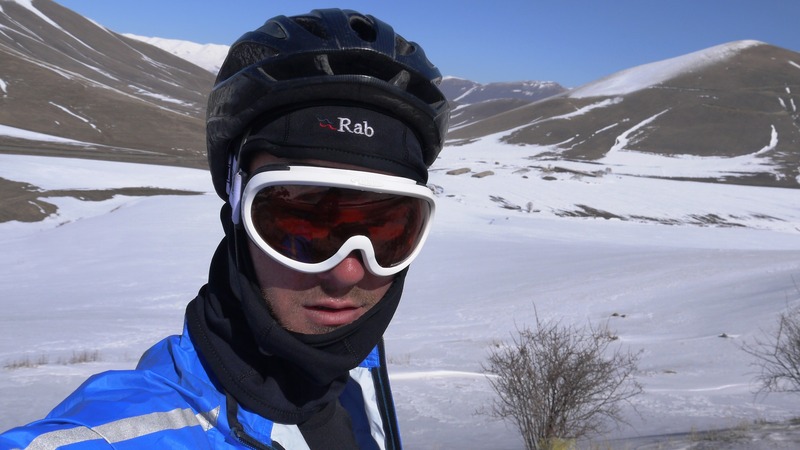 The photos are stunning and your adventure makes my attempt to ride 200km over 2 days (also for cancer research) seem puny!! Good on you and good luck in your efforts!! What you are doing is simply amazing! I admire your energy and commitment — and what a joy to be able to see these photos on a blog. Wow and thank you. One of my favorite memories, going back over 40 years ago, is of climbing the Niggardsbreen glacier in Norway. Very tame by your standards, I’m sure, but exciting for me. A young seminarian was known to stand at the bottom of the glacier every day at a certain time. He carried crampons for anyone who wanted to join him, so my father and I and a half dozen Belgians followed him up to look down a deep cravasse — exhilarating and scary! — and go back down again. It was a postcard perfect day. Altogether, Norway was one of my favorite places I’ve ever visited. You must be the happiest man on earth. Congrats! Wow, that looks so tranquil…and what a fun adventure! Cheers! Stunning photos! Wish I was you! Nice shots! My favorite is the third one from the top – the road plowed out of the snow. Wow. 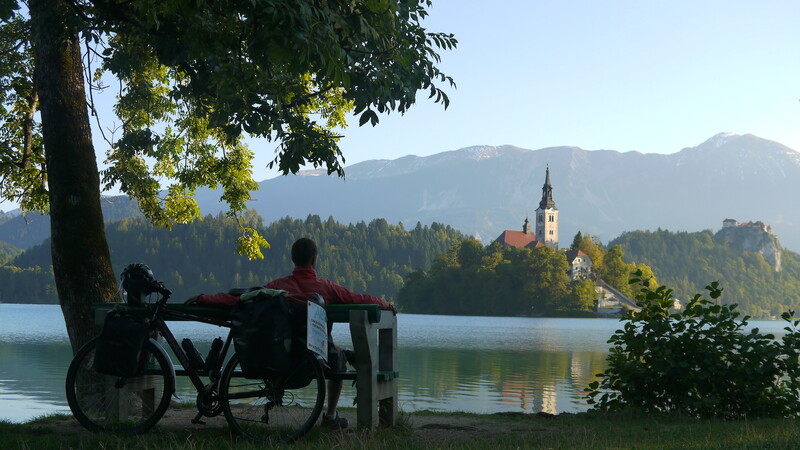 You are literally cycling in a postcard. You are an inspiration. This looks amazing. 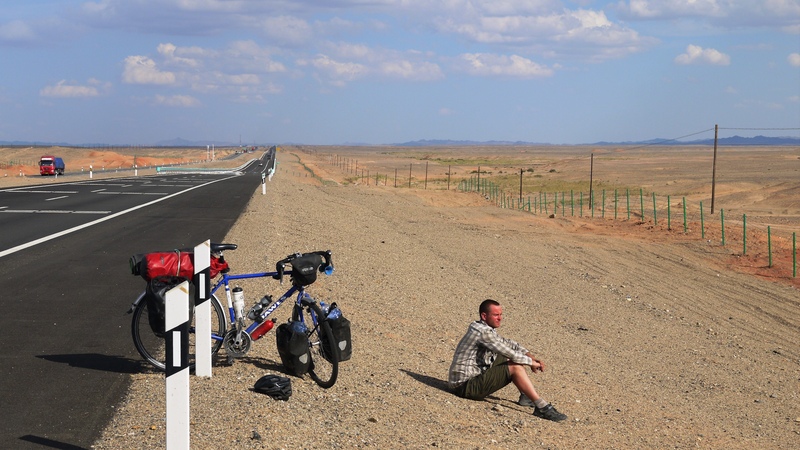 As a cyclist myself, I know the difficulties of traveling just on the means of a bicycle. I appreciate your enthusiasm and effort to provide us your story of your travels. Haveing Cycling most at the same way that you in Norway I say it is wery nice and know you have enjoy it. Keap on enjoy the tour. I sugest you should get you a completly new rim and all spear part you think off before you hit East-europe and, and specialy the Asia. Yes it is cycling shop here but it is not worth looking for quality one and it is rip off both in time and price to have sent Paracel. Breathtaking sceneries. Cycling dreamland, most definitely. Wow, those views are breathtaking and your photos are amazing! This looks like such an incredible journey…Thanks for sharing it with us and congrats on being freshly pressed! I love Norway and your post about it! Thank you. Those photos are stunning! 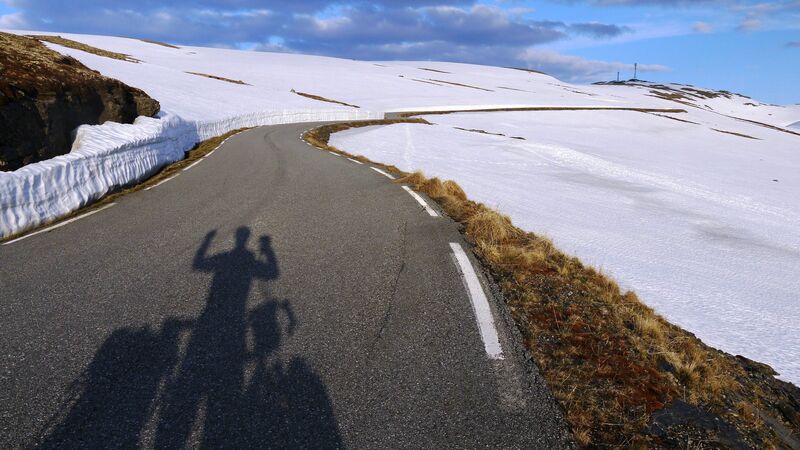 I love the photo of the bike propped up against the tall snow at the side of the road. That looks like SUCH a good time. Congratulations on the ride and being Freshly Pressed! Wow! I respect you so much for what you’re doing. These pictures are beautiful! How long will your proposed route take? Amazing photos and journey – how brave you are to tackle this! I’m curious where you got the chair in the second photo from the top – from the looks of your gear, it doesn’t look like you’ve been carrying it along. Congratulations on your journey and on being freshly pressed. I should move there next. Your photos are breathtaking, you must travel a lot. Wow! Absolutely breathtaking! I want to do this one day. Just found this epic journey you have made. I am moved to tears at the magnitude of this effort. You cannot possibly come back the same person. You have made a difference in a very special way even though you may not feel that yourself. Looks like a fantastic route! Nice photographs! Gorgeous photos and scenery. I am jealous of your trip. It sounds amazing. I shared this on Facebook to spread the word. I wish you lots of luck in your charity efforts! Thank you so much for sharing your experiences! Norway has always enchanted me and while driving through there takes one’s breath, I’m certain seeing it from a bike’s point of view would be much more stunning. Remarkable images! And what an amazing adventure! . . . Thank you for sharing! wow! good luck with your adventure and research! God bless! I hate cold weather, but love these photos. Thanks for sharing. They are beautiful. I wish I can have this kind of experience someday. omg! thanks for taking me to your journey. 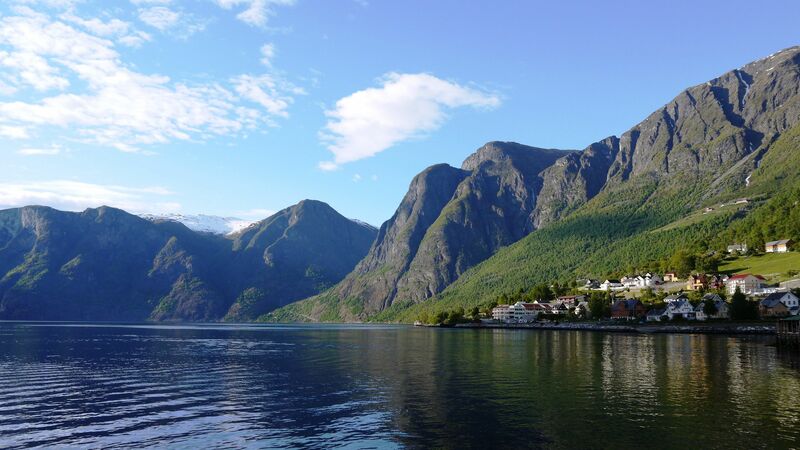 the fjords are my dream to go. amazing. Wow! Add Norway to a country I need to visit. I probably won’t bike around like you did but I would love to see the fjords! The one picture of the road with the snow piled high on each side–that reminds me of Bryce Canyon out in Utah! I went there a few years ago and I think the snow was just as high! This is so beautiful!!! Amazing!! Absolutely Awesome! Thanks for sharing your adventure! Thank you so much for sharing your adventure! Wow! amazing scenery. Thanks for sharing! 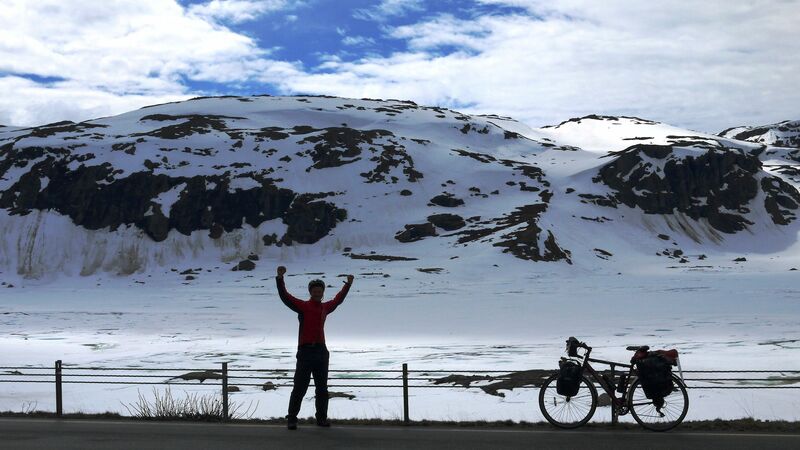 Amazing photos and description of a biker in Norway! Enjoy, as I have! Wonderful cause and really interesting page!! Great post! I’m a biker myself. One day I’d love to do this ride! Great pictures as well. Looking forward to the next post! These are some great great photos, and a really inspiring story. Best of luck on your journey! What an amazing story. Incredible photographs of your journey. You certainly are dedicated and I could feel your exhilaration when you saw nature in the “raw”, Reindeer, Elk, Bear, Peaks and those roads/paths you rode on. I agree, you are an inspiration. What ever you do after this life experience will be just as amazing I’m sure. 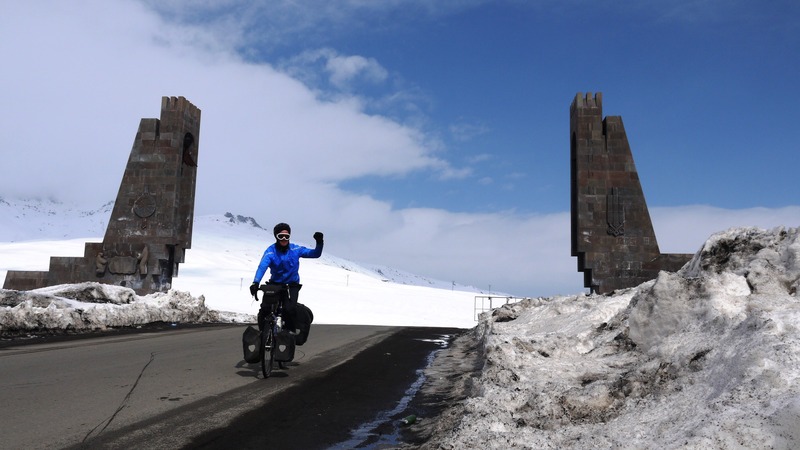 Your photos are beautiful, and well done on surviving all that cycling! It sounds like hard work, but looks like it was worth it 🙂 Also, congrats on Freshly Pressed. Reblogged this on Professional Photography. Anyone’s dream. Gorgeous photos. Thanks for sharing them. Absolutely GORGEOUS pictures and a wonderful cause. I can’t believe all that snow off the side of the road with your bike leaning against it! 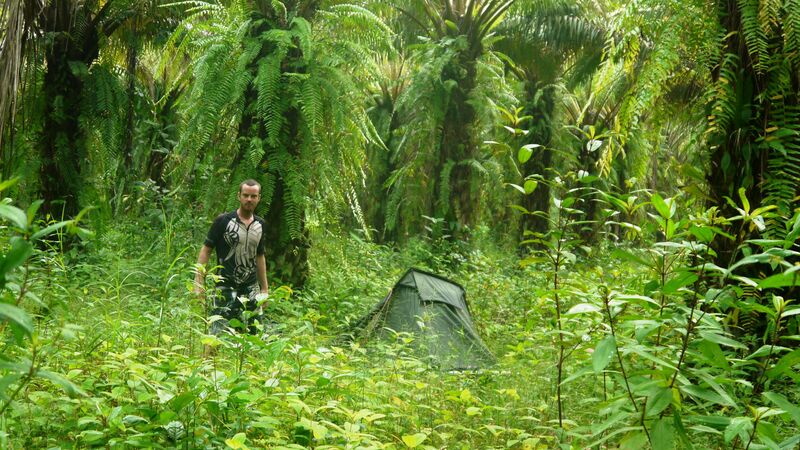 NICE camping sites and views. Thank you so much for sharing! very nice experiences eh ! You are in Vaasa now? need any help around ? I live in Vaasa. Your pictures and your journey are inspiring. The peaks remind me of mountains I have visited in the Canadian Rockies. 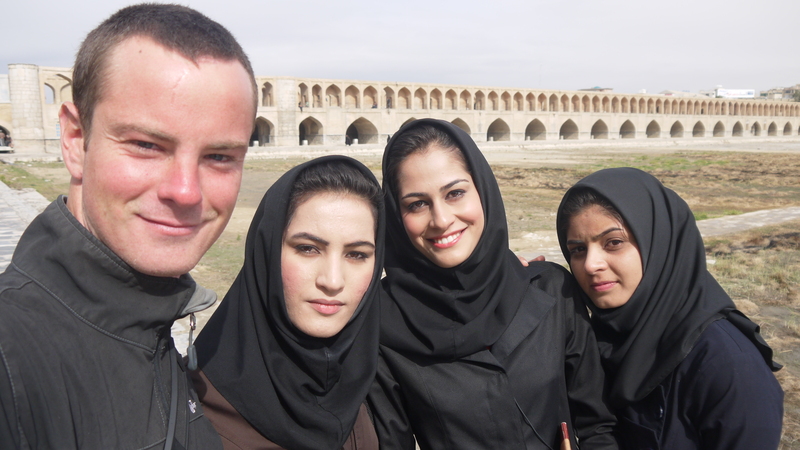 One of the special parts of traveling is the new friendships you stumble upon along the way. Smashing images of a very worthwhile journey. And a great looking blog. I am more than a little envious! Congratulations. Welcome for being on freshly pressed. No doubt, you have gifted an really awesome post with mind-blowing photographs. I like your system of a little description for every photos. Best wishes for you. 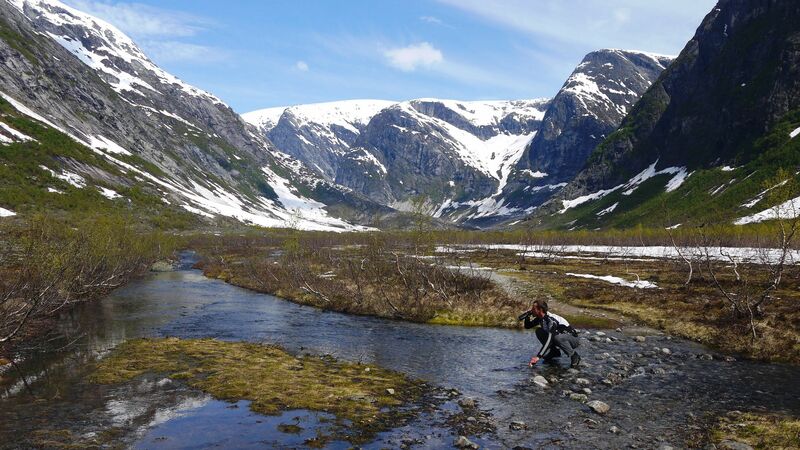 Norway is my favourite p[lace – feel a very strong urge to be there looking at your photos! 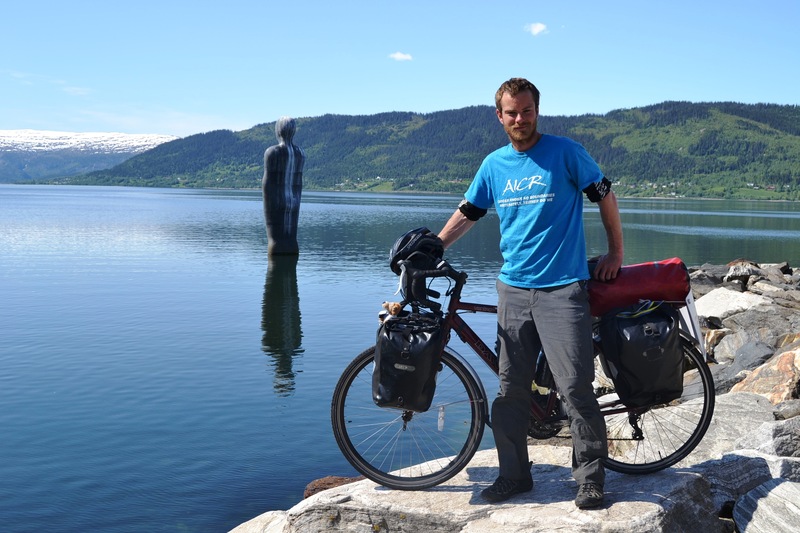 Are you aware of James Duthey’s I Cycled to the Arctic Circle? I would enjoy the world and all it has to offer. 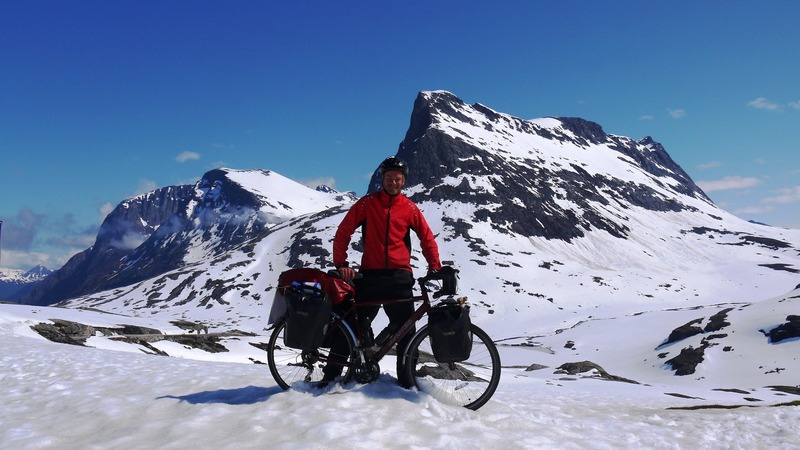 Cycle to the Arctic Circle? Fly around the world – one of my favorites. Kayak the seven seas? Might do a couple miles in each of them. Would you cross each of them? Insiprational journey. I look forward to following your future travels. Love the photo of the road cutwaway! My God, that is breathtaking! I have a Norwegian pen pal, with whom I’ve been communicating for almost twenty years. She lives south of Oslo, yet surely has seen some views like that. 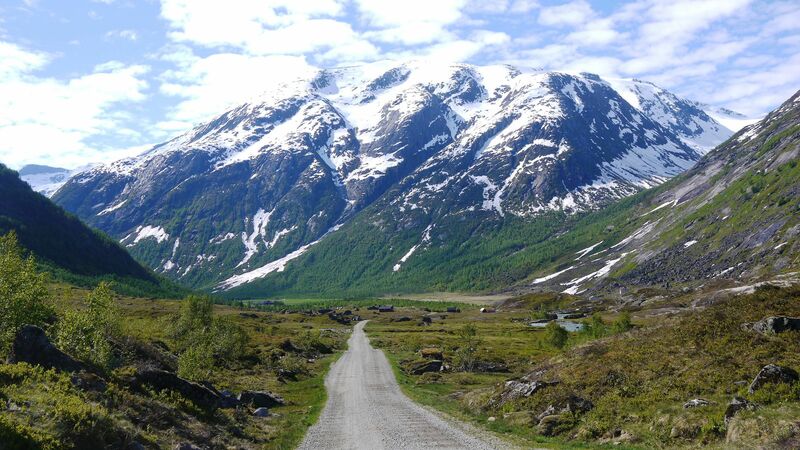 I live in hot, humid, stormy Northwest Florida–and oh, how I would love to be in Norway right now! You are very fortunate! The Man and I are heading to the very North of Norway in two weeks, and your pictures are whetting my appetite! Amazing photos, now I want to become a cyclist .. Someone has the same dream as you! Thank you for showing off my country in such a wonderful way – and for such a lovely cause! Great post! Congratulations on being Freshly Pressed! Norway is such a special place. 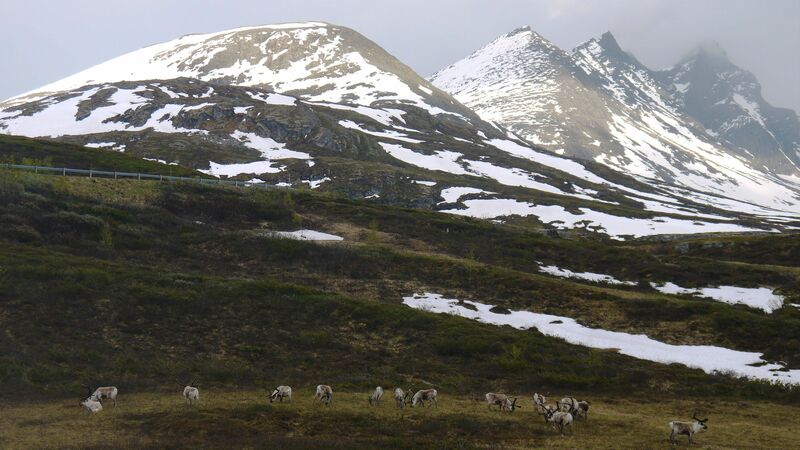 I’m in LOVE with its amazing nature and its crazy people like the wiry pensioners that clamber up the sides of hills without breaking sweat – thanks for sharing your pics, it looks like an amazing journey. 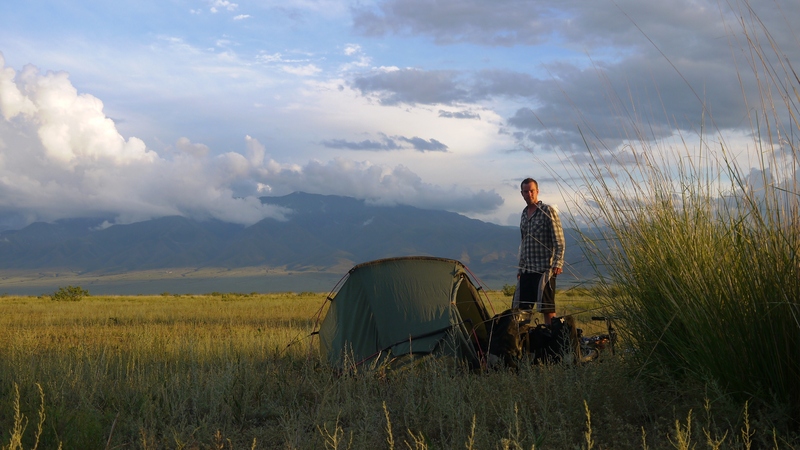 I just wish I could have been breathing that beautiful air as well and camping in the middle of nowhere – magic! Gorgeous!! Get new spokes as soon as possible. When more than one are broken, the rest will follow very quickly. A new wheel is often cheaper than rebuilding and trueing a worn one. Superb images! I traveled the same roads almost 50 years ago. Not much has changed. Absolutely fabulous pictures! Thank you. the view is just stunning! love all those mountains and fjord. a breathtaking view. just wondering, how many people cycled with you when you were there? 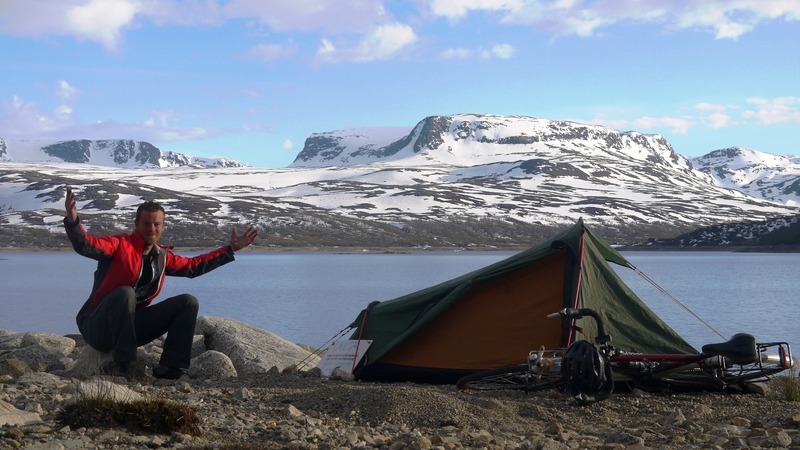 Wow, this post has made my desire to spend time exploring Norway grow even stronger. What a amazing experience! the one photo at dawn/dusk is a knock out. All the best with your Journey! By the way, I’m from the Philippines and currently in Singapore. I see your route, when you finally come to SEA, feel free to drop me a message if there is in anyway I can be of help. I am one with you. Keep up the good work and safe travels! Thank you for your offer to help when I arrive in SE Asia. It’s still such a long way away, but hopefully I reach there safely at the beginning of 2014. 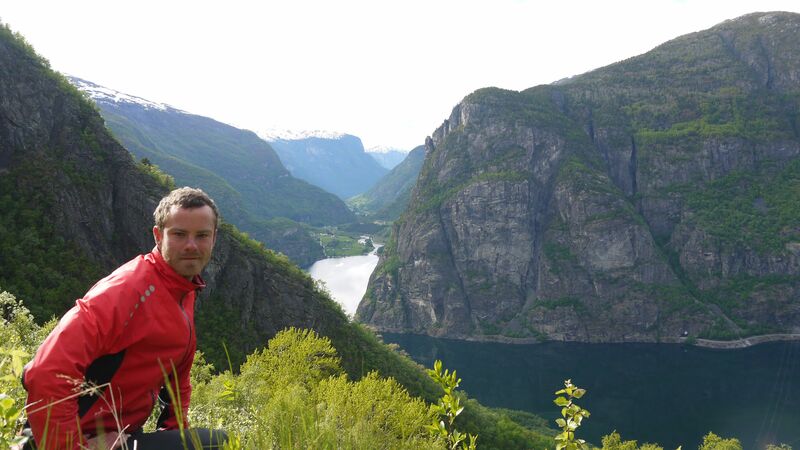 I hope you enjoyed Norway as much as I did; the fjord region was just stunning. You go man! Appreciate you doing this for Cancer Research. A marvelous story and great pics. Congratulations on being Freshly Pressed! Visited Norway in October/November and your pictures make me want to go back! Now! Great photos – beautiful country – wonderful cause! Good luck on the rest of your journey! These scenic views are beautiful! What you’re doing is awesome. Fantastic mountains, and I am comparing to Montana. Keep up the good work. Wow! Looks like a blast! As for cancer.. cycle over to my blog.. try this post here to see what cancer is really all about http://kyrani99.wordpress.com/2012/06/18/why-the-body-reacts-to-form-cancer-part-2/ I am still in the process of posting about cancer but once I have finished that I will show how easy it is to get the body to clear it up.. easy as! What an incredible journey and worthwhile project! It is the music video for post rock band Mogwai’s “How to Be a Werewolf”, which features a cyclist in front of the backdrop of the stunning Norwegian countryside. You don’t have to be a fan of the band to appreciate the video. Hope you like it, and congrats on being FP. Thanks for the link- I’m always looking for new ideas for my own filming too! I have never seen such a beautiful place ever. Norway is looking great. Breathtaking scenery! Two thumbs up! Can you please update your travelling location through Google maps to the post? Wow, I must be sure to visit Norway! No doubt the pictures, which are great btw, are but a glimpse of the experience. the photos are amazing, as always! But looking at them made me realize I am in NEED of holiday, with a real beach, icecold cocktails and an overload of sun.. ! 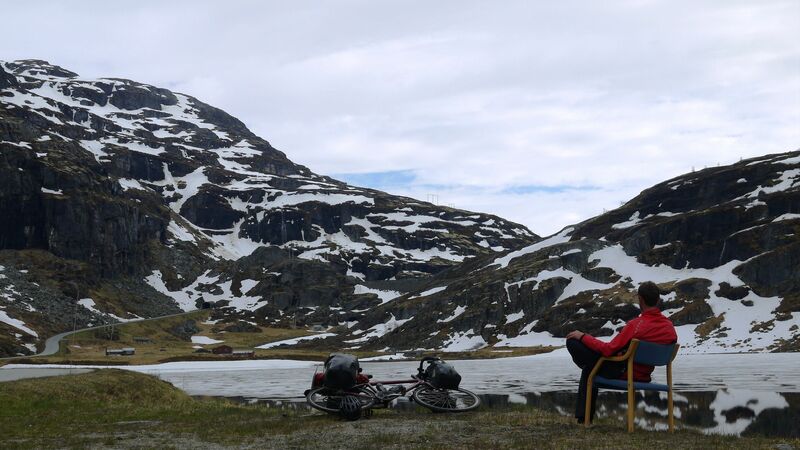 Ohh cycling in Norway sounds like so much fun! Must be amazing surrounded by all that greenery and those pastoral settings! I’m VERY jealous lol. Thank you for sharing your story and those beautiful shots! Your pictures are incredible! 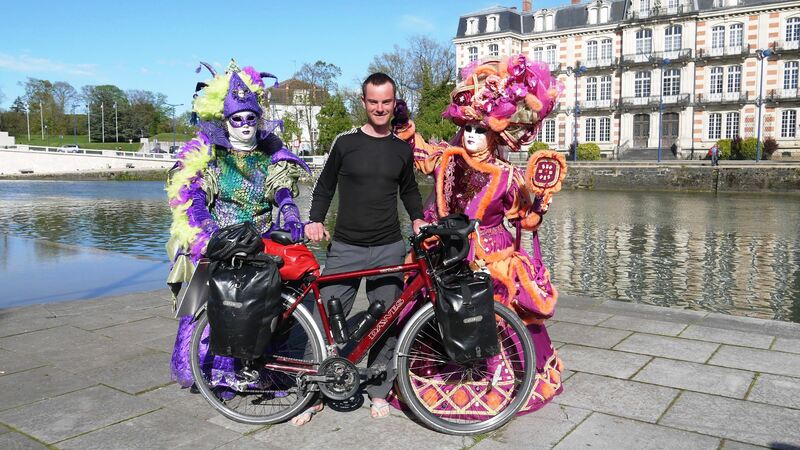 Good luck with your journey and fund-raising for cancer research! Fantastic photos! The landscape of Norway is so peaceful! 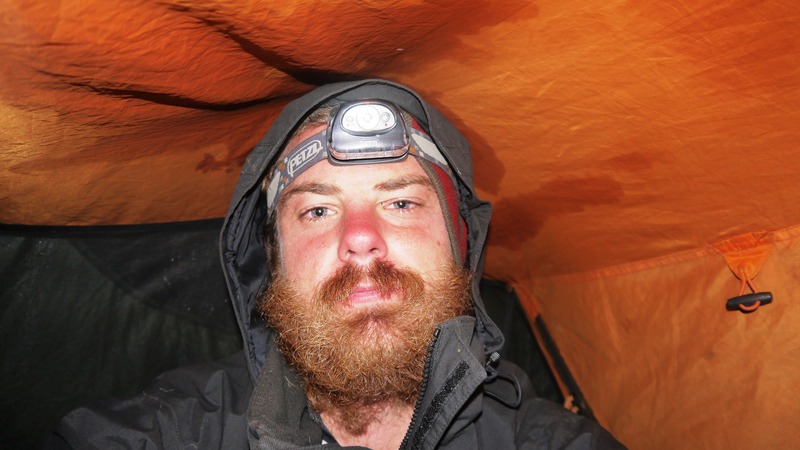 What an amazing journey – inspiring! 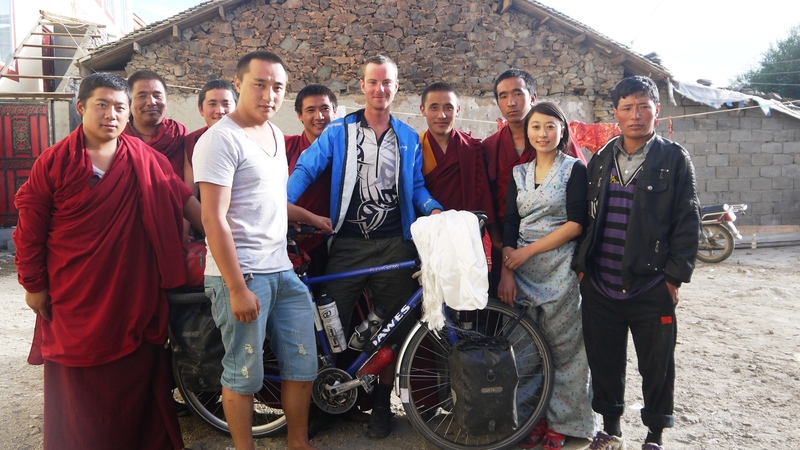 Awesome, inspiring, incredible….this looks like the perfect way to see this country. Excellent post. Unbelievable, what I would give to be there. I once rode the Going to the Sun highway in Glacier National Park before auto traffic was allowed. That was fantastic but nothing like your images, thanks for shared.